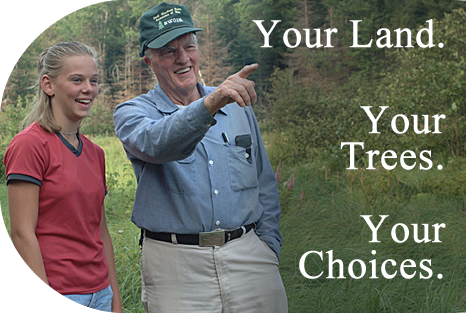 The Maine Forest Service (MFS) will help you make the right choices for your woodland. And our advice is FREE. Get started by discovering all the choices you can make for your woodland. Preview the Be Woods Wise video with Lou McNally. People who own woodland in Maine come to the MFS for answers to questions like these: How do I locate my land's boundaries? What kinds of trees are growing on my land? What is a woodland management plan? When should I plant? Harvest? Find answers. More than one-third of Maine's forest land is owned by people with lots ranging from ten acres to a thousand. Even if you own just a few acres, you're the steward of a complex ecosystem that sustains Maine communities, people, plants and animals. You can rely on your Maine Forest Service to guide you to all the Forestry Resources you need. Stewardship is a frame of mind, a set of principles, and an approach to owning and managing land and resources. Stewardship can be defined as taking care of the land for the long term, and leaving it better than you found it. Sometimes, though, even the best intentions need a little help to get going. Find out more about cost-share assistance available through Woods Wise Incentives.